In Northern Ireland and Belfast the concept of community gardens is a relatively new one. 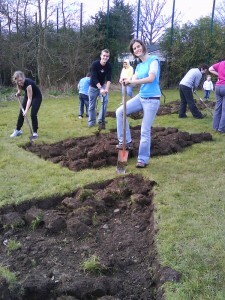 Many people think allotments and community gardens are one in the same. Providing information and engaging with a wide range of community organisations even before you have identified a site is essential. Before setting up our gardens we spent a good deal of time talking to community leaders and community groups, sharing our vision for community garden development. We found that making contact with local organisations was a very effective way of attracting a very diverse mix of people to participate in the garden. Once the garden is established, this engagement work continues. We invite community leaders, those thinking of setting up community gardens and the wider community along to various events during the year. This process awareness raising in relation to the benefits of community gardens means that we get referrals from a range of organisations who understand who will benefit most from involvement with Grow.